Join us in congratulating Anna K. Behrensmeyer! 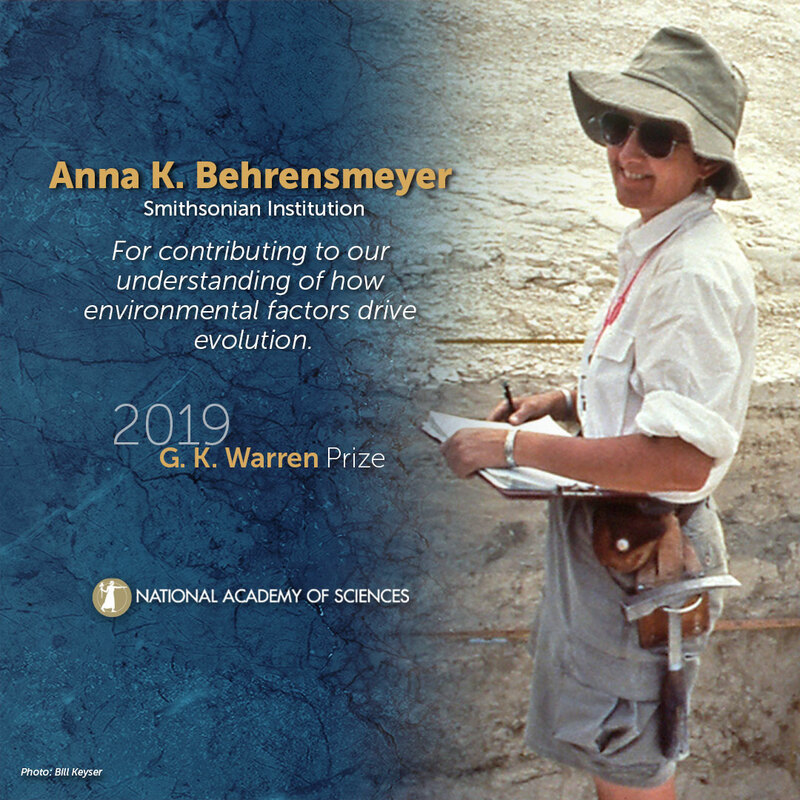 Anna K. Behrensmeyer, Smithsonian Institution, will receive the 2019 G. K. Warren Prize. A pioneering paleoecologist, Behrensmeyer has made important contributions to our understanding of the fluvial processes of ancient rivers and streams, revealing how they are expressed in the rock record and shaping our understanding of ecological change throughout the history of life on land. Through decades of work in the lab and in the field—including the Olorgesailie Basin in Kenya and the Siwalik sequence in Pakistan—Behrensmeyer has aimed to provide detailed documentation of the stratigraphy, sedimentology, taphonomy, and paleopedology of fossiliferous rocks in order to provide new context for past environments. The research has revealed how dynamic environmental change has been a driving factor in human evolution. Field work conducted by Behrensmeyer’s program has unearthed early stone tools and hominin footprints at East Turkana, Kenya; Triassic pterosaurs in Arizona; Jurassic and Cretaceous dinosaurs of the northern Rockies; and diverse Miocene mammals in Pakistan. Behrensmeyer is also known for her groundbreaking work in sedimentary taphonomy—the study of how bones are transported in rivers, how organic remains become buried and fossilized, and the biases that result from these processes, which are essential for understanding information contained in the fossil record—as well as vertebrate ecology and paleoecology, environmental geochemistry, and the paleoecological context of hominid evolution. She is the author or editor of numerous books, including the influential text “Terrestrial Ecosystems through Time: Evolutionary Paleoecology of Terrestrial Plants and Animals,” which establishes guidelines for paleoecological analysis and synthesizes all lines of evidence to reconstruct ecosystem evolution on land through the Phanerozoic. The G. K. Warren Prize recognizes distinguished accomplishment in fluviatile geology and closely related aspects of the geological sciences. The prize is presented every five years with a $20,000 prize. Established through the G. K. Warren Fund by gift of Miss Emily B. Warren. Please use the following sample social media posts and other materials to congratulate Anna K. Behrensmeyer.